Sadder even is that even as the New York City marathon is officially no more, the controversy around it continues still. Now there’s the matter of the race fee. Some 47,500 people paid $250-$350 to run the race, and now they either want their money back, or ask that they be donated to Sandy relief effort. New York Road Runners have announced they will donate $1 million, but to express my very personal opinion, that is not nearly enough. Do the math. With 47,500 registered runners, that’s an average of just over $21.05 per runner. Where will the rest of those fees go? Several weeks ago, I had the pleasure of speaking with one race organizer here, in the Bay Area, about the financial side of planning a race. Sam Fiandaca runs Brazen Racing out of San Pablo, Calif., together with his wife. They are busy people, staging one race (usually a combination 5K, 10K and half marathon) pretty much every other week, for a total of 24 a year. Most of Brazen Racing’s events are in parks or on trails, and are relatively small events – from several hundred to a couple thousand runners. 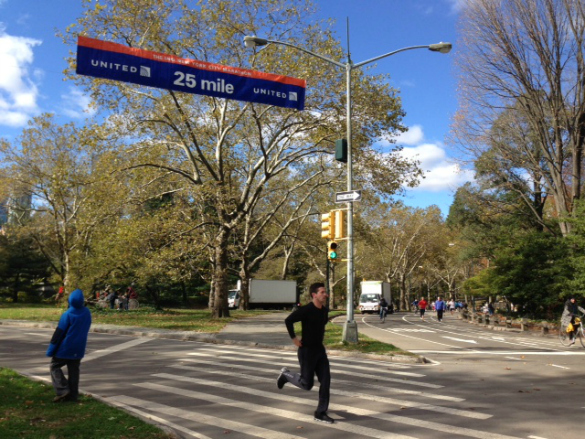 By all means, Sam’s races operate on a scale worlds away from the New York City marathon. But whether you have 500 runners or 50,000, as a race organizer you’re likely spending those fees on the same sort of things. When you average out cotton (for 5K and 10K) and technical T-shirts (for half marathoners), along with printing and shipping expenses, Sam estimates T-shirts end up costing him about $9 to $10 each. Half-marathon participants can forego the T-shirt and save $5. Those are roughly $5-$5.50 each. Smaller medals are cheaper, though Brazen Racing is known for having quite elaborate ones. Sam always buys more medals than the number of registered runners. This is where the largest chunk of cash goes. For Brazen Racing, permit fees range from a few thousand to $10,000, depending upon the venue. That doesn’t include staff overtime — park rangers and/ or police officers are paid by the race organizer to guard race parking and entrance areas, blocked off streets, etc. “If I’m paying $92 per hour for a ranger, for the police you’re talking $150-$175 per hour at least,” Sam told me. Typically, city permit fees are higher than parks permits, which is one reason why road races are more expensive than trail ones. There never seem to be enough near a race start, do there? Costs $75 per toilet, sinks for washing hands are extra. On average, Brazen Racing pays a $350 to a timing company to track runners’ times. Runners’ safety is incredibly important, so you can’t have a race without ambulances and medics. Brazen Racing usually hires two, at $50/ hour. Moving stuff around (speakers, sound systems, cones, course markers, extension cords, etc) obviously costs money, too. When all is said and done, those things add up. And Brazen’s races are among the less pricey ones, generally around $50-$60 for half marathons and $30-$40 for 5Ks and 10Ks. Of course, putting together a race in a park for 500 runners is nowhere near as complex as orchestrating the New York City Marathon — or many of the other bigger road events, for that matter. That’s the main reason why those are so much more expensive. Ironically, the cost of the NYCM – among the highest for a road race – has been under the gun for a while now, most recently questioned by this New York Times magazine article (free up your afternoon before you start reading, it’s a page-turner). 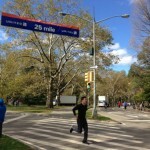 Most likely, NYRR has already spent a good portion of entrants’ fees on staging the marathon that never was. Still, I believe that they should be completely transparent about it and use whatever there is left to either divvy up and refund runners or donate to Sandy relief. Met up with an awesome group of mother runners and their kids at the track today. BabyRuns did almost two laps with me (half a mile!). Then GranmaRuns (who is visiting from far, far away, yay!) stayed with him while I picked up for a mile, followed by some bleachers with the moms and a few easy laps. A short, but perfect run!